You might be surprised to know that the ‘Angelo’ in Angelo’s Fresh pasta Products is not a fictitious character. Angelo was born in the Veneto region in Northern Italy and first started hand-making pasta under his house in Brisbane in 1968. To serve the growing numbers of loyal customers Angelo moved the manufacturing operation to a factory in Wandoo Street, Fortitude Valley in 1975. The business continued to expand and in 1992, Angelo moved Angelo’s Fresh Pasta Products around the corner to their current site on Doggett Street: the big red factory, a landmark in the neighbourhood. In forty years, Angelo’s Fresh Pasta Products has certainly come a long way and has steadily grown to become Queensland’s largest award-winning pasta producer. Angelo attributes his determination and hard work as the secret recipe of his success. The Angelo’s emblem was designed by Angelo and Val prior to formally starting their business in 1968. The individual components of the emblem represent several underlying philosophies on which Angelo and Val based Angelo’s Fresh Pasta Products. Angelo was born in Northern Italy in the Veneto region. The emblem was designed to represent Angelo’s origin, the history of Italy, and the making of fresh pasta. In order to bring this message through the emblem, Angelo & Val decided to incorporate the symbols of the Tre Venezie, literally “Triple Veneto”, representing the three regions of Veneto. The symbols of the Triple Veneto are the Crown, the Wind Rose (Rosa dei Venti) and the Lion’s head. Two of these symbols form the top half of the shield in the center of the emblem. The other symbol—the head of wheat—represents the wheat grain and the 100% Durum Semolina used to make our pasta. Once Angelo and Val had selected the individual elements to be used in the emblem, they needed something to bring all the parts together to form a whole. After careful consideration, they decided to design two rings around the emblem. Not only do the rings bring together all of the individual parts, they also signify the full manufacturing cycle. ORIGINAL AND BEST – Original: Angelo’s was the first to start producing fresh sheeted pasta in Brisbane; Best: represents Angelo’s passion for the business and the philosophy of producing the best possible product. SEAL OF QUALITY – represents the attention to detail and the effort Angelo puts into producing his product. Today, the emblem continues to embody the essence of Angelo’s philosophies. It brings with it the history of the business and the promise of the future. It appears on the packaging of every Angelo’s product – Angelo’s seal of approval guaranteeing that the product lives up to the enduring high standards of Angelo’s Fresh Pasta Products. Born in Northern Italy, Angelo was nineteen when he immigrated to Australia in 1952. He started out finding seasonal work – picking pears in Shepparton, grapes in Griffith, cutting cane in Bundaberg, and planting pine trees in Gympie. Then, after driving trucks for Transfield in Kuranda, took over as their cook and stayed on, cooking for the camp of workers for the next two years. Whilst working on the Snowy Mountain Project in 1963, he received a medal for setting a world record in tunnel drilling – 552 feet in one week! After marrying Val in 1964, Angelo returned to Italy. While there he saw a little shop selling fresh pasta and inspiration struck. In 1965, he bought two small pasta machines and brought them back on the boat to Australia. For the next few years, Angelo ran a restaurant in Brisbane’s Fortitude Valley and used the two small pasta machines to make fresh pasta that he would serve on the daily menu. After the restaurant was sold, Angelo worked as a cook for Transfield at Swanbank for a few months before he started working full-time, making pasta. 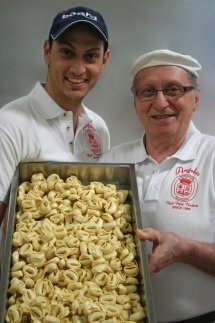 Angelo first started hand-making pasta under his house in 1968 – Angelo’s Fresh Pasta Products was born. Angelo moved the manufacturing operation to a factory in Wandoo Street, Fortitude Valley in 1975. The business continued to grow and in 1992, Angelo moved Angelo’s Fresh Pasta Products around the corner to their current site on Doggett Street: the big red factory, a landmark in the neighbourhood. 2008 marked the 40th anniversary of Angelo’s Fresh Pasta Products. In forty years, Angelo’s Fresh Pasta Products has certainly come a long way. Angelo attributes determination and hard work as the secret recipe of his success. 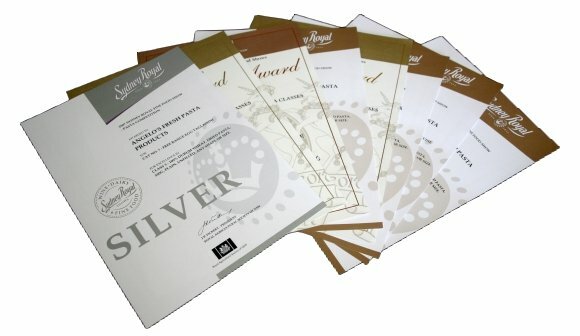 Angelo’s Fresh Pasta Products has won many awards for our pasta products at the Sydney Royal Food Show including winning the Pasta Championship (Gold Award) for the 100% Durum Wheat Fresh Pasta category in 2003, and Silver in 2007 for Free Range Egg Pasta. Today, Angelo’s supply the food service industry including restaurants, hotels, supermarkets, delicatessens and corner stores. Recently Hog’s Breath Café Australia, the largest home-grown restaurant chain in Australia and New Zealand, selected Angelo’s to supply them with our Ricotta and Spinach Filled Tortelloni. The Ethnic Business Awards commenced in 1988 and was the brain child of founder Joseph Assaf. The Awards celebrate the success of migrant contribution to Australia. As one of Australia’s longest running business awards, the Ethnic Business Awards continues to recognise and reward the valuable and innovative contributions migrants have made to Australian business and the economy. The Ethnic Business Awards are comprised of three (3) categories: Small Business, Medium to large Business and 2010 marked the first year for the ‘Indigenous in Business Award’. Today the Ethnic Business Awards continue to provide a unique and prestigious recognition of Australia’s migrants, who have followed their dreams and overcome hardship to accomplish well deserved success. In 2010, Angelo was one of 15 national finalists from 600 national nominations. Whilst we always appreciate public recognition through industry awards, our most precious recognition comes from our customer feedback and continued support for our fresh pasta products.